I spoke with Corey via email. I loved learning about her family. Her partner and their three son were eagerly anticipating the arrival of their fourth little boy. 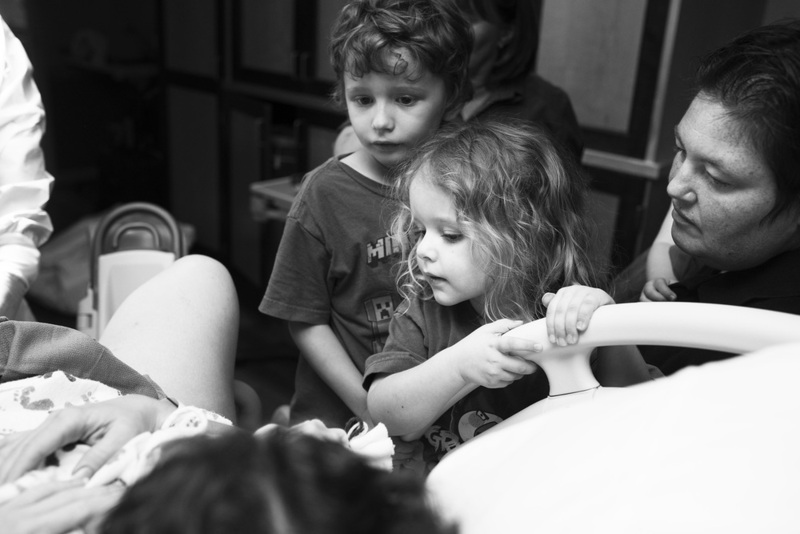 When I learned that they were going to let the boys stay in the room during delivery, I was even more excited to capture this special day. Children do remarkably well during birth. I'm convinced that the older we get, the easier it is for us to lose touch with what is natural and normal. Corey reached out to me when she started having mild contractions on Friday morning. When contractions picked up, I hopped in my car and headed towards Poudre Valley Hospital. When I arrived, I was greeted first by the boys, who were clearly ecstatic and very ready to meet their little brother. Corey was laboring calmly in the bed (so calm that I thought we'd surely have several hours to go before her little one made his arrival). But Kieran had plans of his own (and Corey was an incredibly peaceful laborer!) She soon felt the urge to push, and within several minutes, Kieran was brought up into her arms. Birth is breathtaking. A baby's first cry. A mother's relief. The look of an older brother as he sees his life-long friend coming into the world.